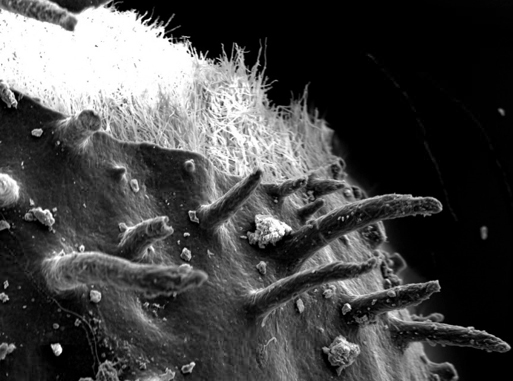 Every fall at the Science & Math Summer Research Symposium, the Puget Sound Science Core Facility awards the winners of the Annual Microscopy Image Contest, which is sponsored by Nikon Instruments Inc., and Leica Microsystems. The contest is held to encourage students in the Math & Science departments to showcase photos they take during research. I’ve never submitted a photo, but I always enjoy learning about my peers’ research! Flared crossed pedicellaria of a large Pisaster ochraceous responding to contact with a large Evasterias troscelli. Pedicellariae are claw-like structures situated in clumps covering the surface of a sea star and are used in interference competition with other species of sea star. After identification by 16S rRNA gene sequencing, filamentous bacterial mat samples from the high sulfide sediment of Commencement Bay were prepared by Fluorescence in situ Hybridization (FISH). 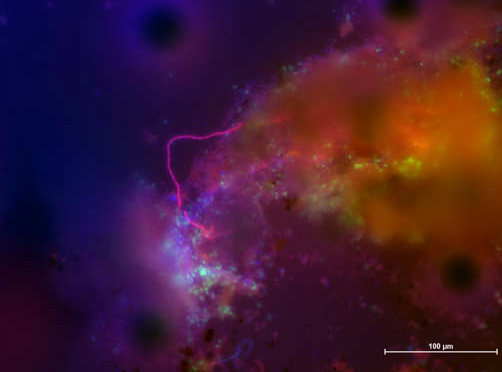 The microbial community in the mat was then visualized using epifluorescence. The genera Arcobacter (green) and Sulfurovum (red) were labeled by the fluorophores FITC and Cy3, respectively. Environmental DNA is stained with DAPI (blue). The image was taken at 20X magnification on the Nikon D-Eclipse C1 Confocal microscope. Specimen collected from maple trees along Interstate 5. Fungal hyphae (white hair-like structures) protruding from a breach in the lower cortex of a folios lichen (Parmelia spp.). Holdfasts (darker root-like structures) extend out of the lower fungal cortex. These structures allow the lichen to cling to its substrate. Taken by Kelsey Crutchfield-Peters ’14 on the Hitachi S3400N Variable Pressure Scanning Electron Microscope in the Science Core Facility. 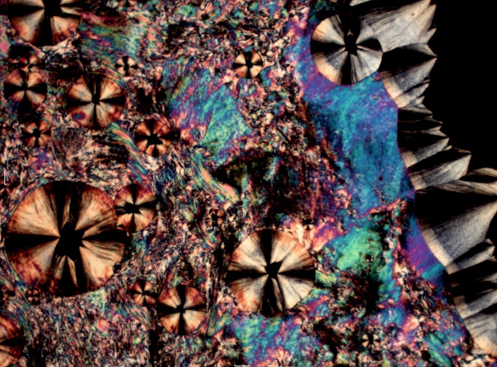 Polarizing Light Microscopy of liquid crystals being cooled into regular crystals taken by Mary Packard ’15 on a Nikon Labophot 2 POL microscope equipped with a Mettler Toledo hot stage FP82HT and an FP90 central processor. 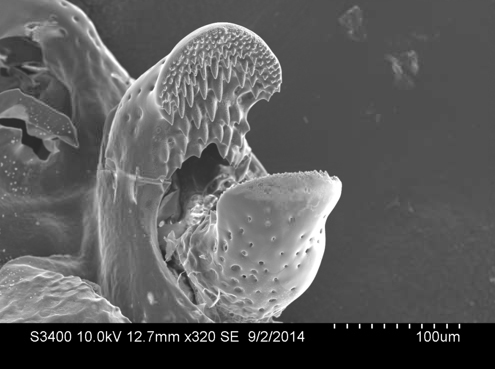 Think you’ve got some awesome microscope pictures from your coursework or research? Submit them to the contest for next year! Entries can be generated from any time you’ve been a student at Puget Sound. This year, the grand prize was a Nikon digital camera and the prize for winning the “People’s Choice” category was a Leica wrist watch, both generously donated from the contest’s sponsors. More incentive: all entrants this year received a flash drive and travel clock provided by Leica! Captions for images provided by entrants, through the Science Core Facility – click to see more entries! To see other student-generated research, search Sound Ideas, Puget Sound’s digital works collection, made available through Collins Memorial Library.